WRENTHAM, Mass. – North Attleboro boys lacrosse ended it’s regular season exactly how it wanted to as it prepares for postseason play: beat a quality opponent. Big Red showed the type of resilience, toughness, and discipline every coach preaches about, especially heading into the playoffs. After going down 2-0 and not converting on two separate man-up opportunities, North strung together five unanswered goals in four minutes to take control of the game, eventually leading to a 9-4 victory for the visiting Rocketeers. Turnovers and penalties plagued the Warriors all game long, throwing the ball away 24 times throughout the game and collecting eight flags in total. There was a lot of positive to build upon on that’ll suit King Philip well heading into postseason play. Goalie Jeremy Elpus made eight saves many of which coming on penalty kills, Chris Longobardi was dominant at the faceoff X, winning 12 out of 14 contests, and the man-down defensive unit also killed six of eight penalties. KP’s man-down unit turned away four shot attempts just two minutes into the game and then caused a turnover just as they were back to even strength. One minute later King Philip was hit with a 30 second technical that they were able to kill and clear. This led to the first score of the game, courtesy of Kevin Riggs (one goal, one assist) on a feed from Robert Tartaglia. 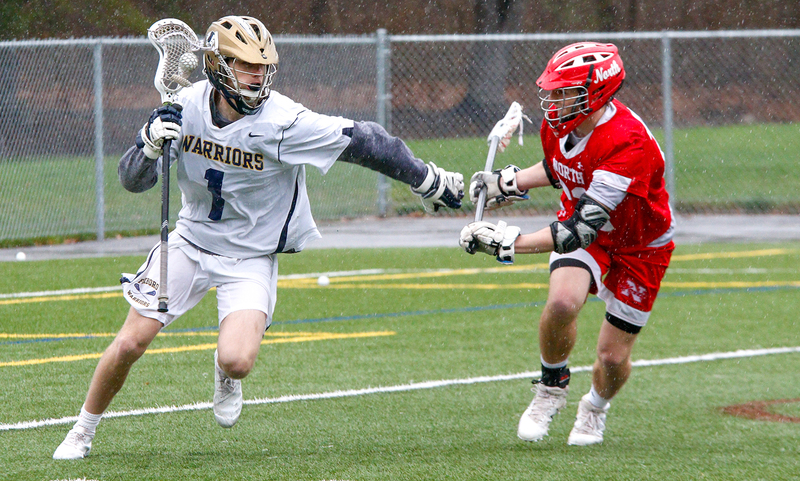 Less than a minute later, Colin DeVellis (two goals) fired one in to give the Warriors a two-goal lead. The Rocketeers didn’t flinch though. 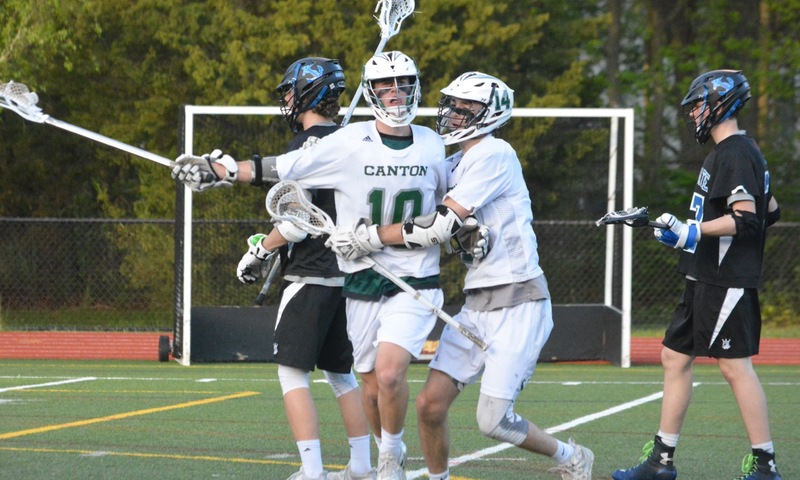 Instead, they turned to sophomore attackman Andy DeMattio (five goals, one assist), who found the back of the net four times in the final four and a half minutes of the first quarter. Tommy Lindstrom (one goal, three assists) fed Jack Connolly (one goal, two assists) for a hard-earned goal on a continued penalty, Jason McNeany won two consecutive faceoffs, the defense buckled down to force three turnovers, and suddenly North had all of the momentum riding a 5-2 lead to end the first. The Warriors response came halfway through the second quarter when Riggs found Nate Minkwitz to cut the lead to two. North’s special teams capitalized on one of those turnovers, leading to an ankle breaking split dodge from Damien Curtis to get around a King Philip defender and snipe one inside the near pipe. DeMattio found Lindstrom of off another turnover to mount a 7-3 lead with ten seconds remaining before the half. King Philip’s defense killed back-to-back penalties early in the second half. 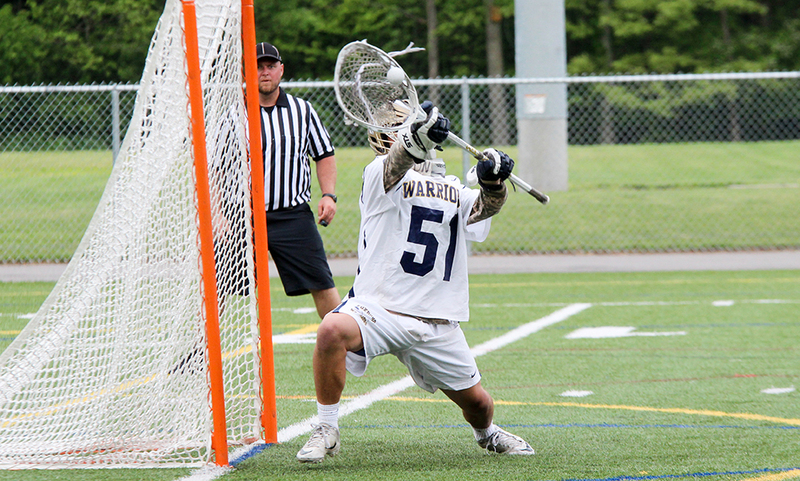 Both times the Warriors were able to clear the ball to an attackman on a fast break with a chance for a huge momentum swing, and both times they were stuffed at point blank by Jake McNeany (10 saves). Big Red’s vaunted defense, currently averaging a 10th best in the state 4.7 goals per game, flexed its muscles and caused nine turnovers, while holding the Warriors scoreless in the third quarter. DeMattio opened the fourth quarter by scoring his fifth goal of the afternoon on an assist from Jason McNeany. DeVellis answered with his second of the game, but after North’s defense caused another turnover on the ensuing possession, Big Red was able to run out the majority of the remaining six minutes. King Philip (9-8) will look to regroup next week as its host Bishop Feehan in its regular season finale, while North Attleboro (14-4) has completed their regular season and will have to sit tight until playoff seeding is announced on June 1st. “This season has been a lot of fun,” said Young. “We have a lot of young kids, and that’s been challenging, but they’re really handling it well. Today was a great way to finish the season. Our kids took control and got it done against a Division 1 tournament team.